Breakfast Boxes, for Glasgow: freshly made pastries, bakes and bread, available for collection every weekend. That's right - the Big Bear Bakery Breakfast Box. We had to order more Bs to even fit that on our letterboard. 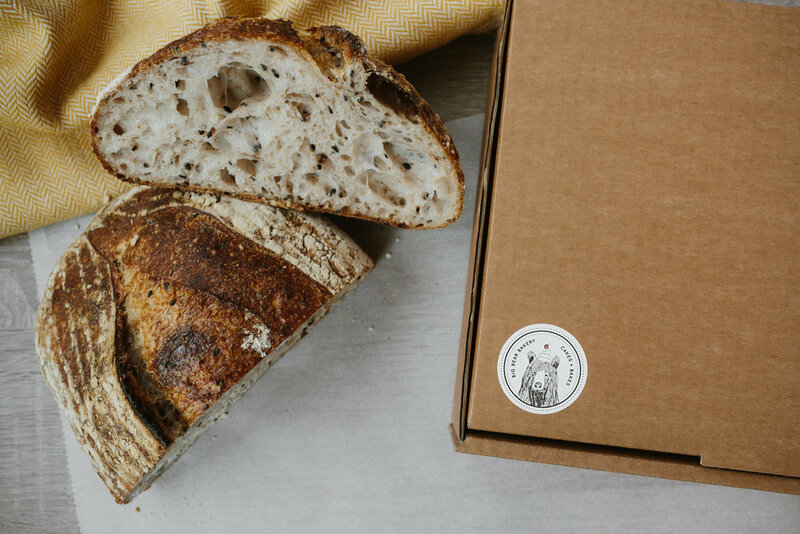 You're going to love them: a weekly treasure trove full of delicious fresh-baked goodies and a loaf of beautiful crusty sourdough bread. Available for collection every Saturday, to make for the perfect lazy Sunday. Every week, we'll rotate the selection of pastries, croissants, natas, bakes and bread. Simply reheat at home and enjoy the crisp, buttery pasty fresh from the oven- or, you know, scran it on Saturday afternoon if you can't wait I guess. Collection is available every Saturday from 12 noon - 3pm, at Platform at Argyle St Arches, Glasgow City Centre, and all purchases must be completed in advance on the website. Don't order unless you're sure you can manage that location, time and place - the boxes are made to order so we're unable to offer refunds! Fancy it? Just pick the one you want below, and purchase by Wednesday at 9am to confirm your collection for the coming Saturday!